(Cincinnati, OH) – Springtime fun begins Wednesday, May 1, at the award-winning Wake Nation Cincinnati watersports’ complex in Fairfield’s Joyce Park. Wake Nation Cincinnati is the first and only full-size cable wakeboarding park in the Midwest. Visitors to Wake Nation this year will find an entirely new configuration of obstacles on the lake, including a brand new state-of-the-art rail, bringing the total number of lake rails and jumps to ten. At Wake Nation Cincinnati riders can wakeboard, water ski, kneeboard, and wake skate around a 10-acre lake without a boat! Riders are pulled around the oval lake at speeds of 18-20 miles per hour by a circulating, overhead cable system that runs 35 feet above the water. Six riders can be on the water at the same time. In addition to the 10-acre main lake, Wake Nation Cincinnati has a second body of water called the Practice Pond, which is a smaller lake featuring an “easy start” ride system. The Practice Pond is designed to give kids and beginners of all ages a place to learn to ride a wakeboard at a slower speed than on the main lake. All riders must be at least 7 years of age and are required to wear a Coast Guard Approved (CGA) life vest and a helmet, which are available at Wake Nation. To help celebrate the 2013 season, Wake Nation Cincinnati will host a special event on Saturday, June 15 — the Liquid Force “Free For All, a one-of-a-kind event with a full day of music, food, giveaways, professional wakeboarding demos and FREE wakeboarding for the public. During the Liquid Force “Free For All” day, the public can try out all the new 2013 Liquid Force Wakeboard products on-site, plus on hand will be multiple Liquid Force global team-riders showing off their skills, giving pointers, hanging out and signing autographs. It’s a fun, relaxed, and non-intimidating environment for the first timer and for seasoned wakeboarding veterans alike. (More information on this event will be sent soon). During the spring, Wake Nation is open Wednesday through Friday noon-8 p.m. and weekends 10 a.m.-8 p.m. (closed Mondays and Tuesdays). The daily summer season begins Saturday June 1 with a 10 a.m. opening time everyday except on Mondays when the park opens at noon. Closing time all summer long is 8 pm. The Wake Nation complex has a full pro shop, equipment rental shop, concessions area with numerous new items, and a huge outdoor observation deck offering a panoramic view of the entire lake area. Wake Nation Cincinnati opened to rave reviews in the spring of 2009 and at that time was only the 7th cable wakeboarding park in the nation. The next closest cable wake park is more than 800 miles away in Kansas City. Since its opening, Wake Nation Cincinnati has received numerous awards, including three prestigious “Best Of” awards from Ohio Magazine, Cincinnati Magazine and Cincy Magazine. 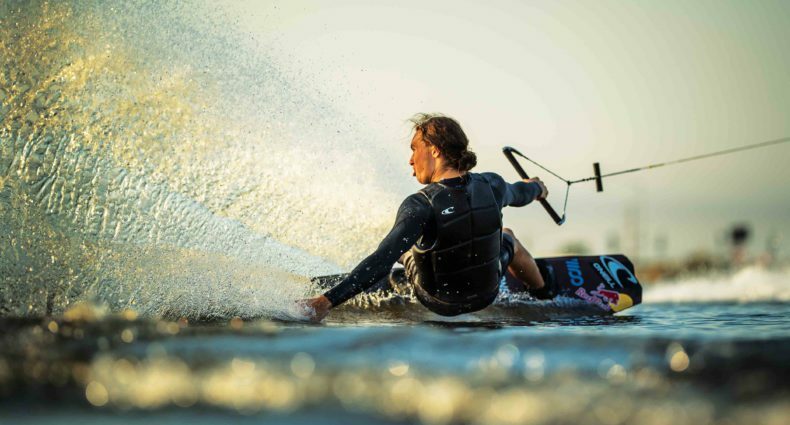 The success of Wake Nation Cincinnati has led the ownership team to build and operate a similar cable wakeboard park in Houston, Texas, which just kicked off its third season. At Wake Nation Cincinnati, both parking and admission are FREE. The park is a “pay as you play” facility with ride time starting at $30 for two hours. Rental equipment, private lessons, group discounts, summer camps, birthday parties and season passes are available. or email info@wakenation.com. Website: www.wakenation.com.